Although it is well known that the classic orb-weaver, Araneus diadematus Clerck, finds prey in its web by plucking and feeling the tension of the various radii, an orb-weaver such as Nuctenea umbratica Clerck uses quite a different method. As soon as an initial thud is felt through the web, N. umbratica, centred in the hub, shakes back and forth until the whole web oscillates; then the spider counteracts the shaking by reversing the swing. If the web is empty, it will become still. However, an insect with a relevant mass, will keep on resonating while the web is still, because the spider's counteraction was just enough to freeze the web, but not enough to stop the movement of something heavier. (This hypothesis still has to be proved using high speed cinematography). It is by this method that N. umbratica, although having poor vision, is capable of locating a stick or leaf within seconds after contact with the web. Added by John Partridge at 10:27 on Tue 3rd Jan 2012. It may be perhaps of interest to British fellow arachnologists to know that this species has the habit of overwintering under bark also in a comparatively mild climate such as that of central Italy. On February 22nd., 1970 I was collecting with a friend along the Monaci Lake (SSE of Rome), in the midst of what were once the Pontine swamps (now a completely reclaimed and cultivated region), near to the sea. Under the bark of a few Eucalyptus (now a very common tree in central and southern Italy) we found a comparatively rich spider fauna; some large females of A. umbraticus, many males, females and juveniles of A. sclopetarius Clerck, some Dysdera (which I have still not yet identified) and a male of Dysderina loricatula Roewer. All these spiders were very near to each other, under a few pieces of Eucalyptus bark (which can be very easily detached). I remember that whereas the Dysdera, when disturbed, attempted to run away (although not so quickly as usually), the Araneus were extremely torpid and began to move only when put in alcohol. In central Italy, the month of February is normally one of the coldest and one in which very few spiders can be found by sweeping or beating. Only in a typical Mediterranean 'macchia' (= maquis), indicative of a very mild climate and with many evergreen plants, can such methods be useful in winter. As in Latium (under 500 metres) it snows very rarely (no more than a few days each year) the activity limiting factors for larger snare-building spiders could be apart from that of temperature, the lack or rareness of prey, and the reduction of the vegetation suitable for supporting the web (the grass is very low until April-May and most shrubs are still without leaves). In the few places, mostly very humid, where the grass is still high some juvenile Araneids can be found. In January, near Rome, I could find by sweeping; juvenile Singa and Araneus of the cornutus group; in the same period (January-February) in the Pontine islands (with a typical Mediterranean vegetation and climate) many more species were active: Mangora acalypha (Walck.) , Cyclosa insulana (Costa) , Araneus subfuscus (C.L. Koch) , Zilla diodia (Walck.) , Zygiella x-notata (Clerck) and Z. atrica (C. L. Koch), but only of the last two could I find some adults (females). Added by John Partridge at 10:21 on Tue 3rd Jan 2012. It may be perhaps of interest to British fellow arachnologists to know that this species has the habit of overwintering under bark also in a comparatively mild climate such as that of central Italy. On February 22nd., 1970 I was collecting with a friend along the Monaci Lake (SSE of Rome), in the midst of what were once the Pontine swamps (now a completely reclaimed and cultivated region), near to the sea. Under the bark of a few Eucalyptus (now a very common tree in central and southern Italy) we found a comparatively rich spider fauna; some large females of A. umbraticus, many males, females and juveniles of A. sclopetarius Clerck, some Dysdera (which I have still not yet identified) and a male of Dysderina loricatula Roewer. All these spiders were very near to each other, under a few pieces of Eucalyptus-bark (which can be very easily detached). I remember that whereas the Dysdera, when disturbed, attempted to run away (although not so quickly as usually), the Araneus were extremely torpid and began to move only when put in alcohol. In central Italy, the month of February is normally one of the coldest and one in which very few spiders can be found by sweeping or beating. Only in a typical Mediterranean 'macchia' (^ maquis), indicative of a very mild climate and with many evergreen plants, can such methods be useful in winter. As in Latium (under 500 metres) it snows very rarely (no more than a few days each year) the activity limiting factors for larger snare-building spiders could be apart from that of temperature, the lack or rareness of prey, and the reduction of the vegetation suitable for supporting the web (the grass is very low until April-May and most shrubs are still without leaves). In the few places, mostly very humid, where the grass is still high some juvenile Araneids can be found. In January, near Rome, I could find by sweeping; juvenile Singa and Araneus of the cornutus group; in the same period (January-February) in the Pontine islands (with a typical Mediterranean vegetation and climate) many more species were active: Mangora acalypha (WalcJc.) , Cyclosa insulana (Costa) , Araneus subfuscus (C.L-. Koch) , Zilla diodia (Walck.) , Zygiella x-notata (Clerck) and Z. atrica (CÂ»L. Koch), but only of the last two could I find some adults (females). Added by John Partridge at 10:18 on Tue 3rd Jan 2012. The report in the November Newsletter No. 6 (should be No. 5) of finding specimens of Araneus umbraticus Clk. overwintering under bark prompts me to record a similar observation I made in Scotland several years ago. On December 25th 1954 I found a group of mature females of A. umbraticus under the bark of a tree on the south-east shores of Loch Treig, Invernessshire, near the mouth of Amhainn Chamabhreac (altitude about 1000 ft). There was a little snow at this altitude, and the weather was rather mild and wet for the time of the year. Unfortunately I no longer have details of this finding so that I cannot give the exact number of spiders found but there were 6-10 large females, all quite torpid and huddled together in a single group. Nor do I have a note of the species of tree, but my recollection suggests that it might have been birch. It may be of some interest that between the 25th and 27th December, 1954, I collected 15 species of spider (including 9 Linyphiids) on the moorland and in the woods near Loch Ossian Youth Hostel. All the specimens were adult except one (a female Drassodes lapidosus) and were species which might be expected to occur in such a region. Secretary's Note: Dr. Roy's note comes from him at the John Curtain school of Medical Research, Canberra City Australia. I can also report that A. umbraticus Clk. 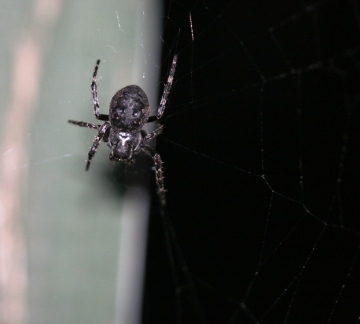 has been actively web spinning on many nights in my garden near Carlisle throughout the mild winter. The ensnared prey seems to have been no more than a few fragile winter gnats and many minute flying Diptera. Added by John Partridge at 10:13 on Tue 3rd Jan 2012. During January 1969 at Kirkby Moss, near Liverpool, Lancashire, I found an adult female Araneus umbraticus hibernating beneath the bark of a small Birch tree (Betula verrucosa). On the 15th. February in the same locality, I examined another Birch tree and discovered a second adult female of this species hibernating. Both specimens were quite large and their epigynes could be seen clearly. The second specimen was examined on a bitterly cold day. The spider was in a very torpid condition and hardly moved when handled. All of its legs were tucked in tightly under the body, which had a curiously dried-out appearance due to it being covered with tiny particles of ice. When it was laid on its back, it did nothing except to move its front legs feebly. According to Locket and Hillidge (1953) , it is stated that another species, A. diadematus, takes two years to mature. Dr. Jacob Graf (1968) states that this same species prepares several egg cocoons in September and October, dying beside the last one. This would mean that this species overwinters while still immature. Unfortunately, I cannot find any information regarding the life span of A. umbraticus but it seems possible that on occasions it may live beyond two years including one winter as an adult. Locket and Millidge (1953) British Spiders Vol. II. Ray Soc. Dr.. J. Graf (1968) Animals of Europe.